You had a fabulous chart not long ago that showed income, net of government benefits, comparing US to other countries. It appears that Perry's chart does not include those benefits. The cluster might be much tighter on the bottom three quintiles than is apparent by the chart. Hence, there is less incentive, or maybe a disincentive (loss of benefits) for any work at the minimum wage rate. Unless there are more data at the link about hours worked, $11k per year suggests something near $5.50/hour. An hourly wage of $14 for a full-time worker would be over $28k/year. I am struck by the age distribution. Very few of the top quintile are over 65... of course, as many people over 65 are retired, and are not making the same +$90k/earner that they did while they were working full time. The other quintiles have approximately a third of their group members over 65... So not all retired people drop into the lowest quintile. So I am a bit confused how to adjust this data for retirement, which involves both less income and (probably?) less spending (consumption and investment) as compared to a working family. You are looking at the wrong row. 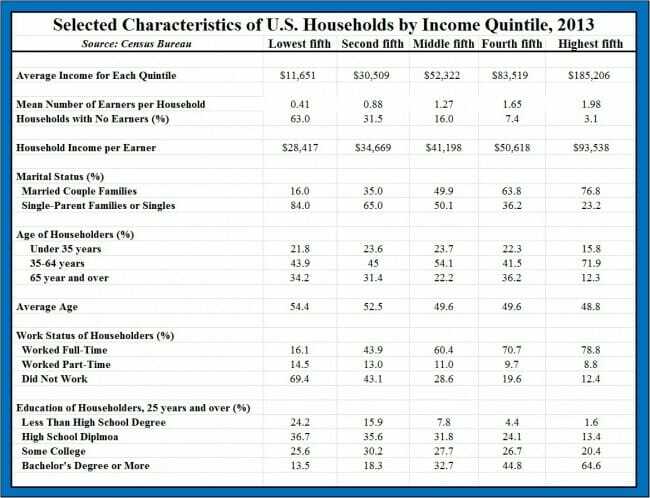 Go down three rows to "household income per earner," rather than "average income for each quintile." It happens to be right around $28k. "but I am SURE that those on the Left who promote the idea of rising minimum wages increasing employment would not accept these assumptions"
Don't be so sure. At least some on the left argue that safety net benefits should be generous enough that people won't be compelled to accept 'crappy jobs'. Yep, missed that. Thanks. If the 37% of income earners with jobs in the lowest quintile earn a mean of $14/hour, then all of the hue and cry about raising the minimum wage is just noise. To increase employment among that cohort, minimum wages should be abolished to match skills with remuneration. That, and transfer payments should be reduced to incentivize the "poor." I'm not sure the chart supports the conclusion you draw. The fact that the average earner is making $28k per year only means they are making $14 per your if they are working a normal 40 hour week. It would not surprise me if a lot of those working are actually working multiple part time jobs. I definitely run into many people who are in that boat -- working at Subway part time, working at a restaurant part time, etc. And unfortunately the AEI article isn't clear on this point. To me, the problem with arguments about the minimum wage is that, as has been stated in many places, minimum wage was not designed to be a "living wage" it was designed to be a "starting wage". Unfortunately due to the economy the traditional minimum wage starting job has become a long term job. Is it just me, or doesn't it look like they are including retirees in the bottom fifth category? 34% of the category is over 65. 63% have no wage earners. Could it be that a sizable fraction of that 34% are actually retired and although they have no income, aren't poor? Agree. He goes on to say that the problem isn't wage rate but full time work (which I happen to believe as well) but the only way $28k = ~$14 an hour is by using a 40hr. work week. Something doesn't add up. If Household Income by Earner is $28k and each of those earners is working less that 40hrs then the hours each earner is actually working are being compensated at a rate > $14/hr on average which I very much doubt. People's decisions of whether to work (or work more) vs. accepting benefits are mostly functions of how sharply a person (or family) loses eligibility for benefits as income goes up. Ideally, that cutoff ought to be gradual enough that it always pays, at least a little, to work more if you can. The current system clearly does not satisfy that condition, but it's hard to pin down the exact cutoff curve because of all the different types of benefits available. And of course, not all un- or under-employment is voluntary. I would eagerly work twice the hours I do now. As bigmaq suggests, the chart almost certainly excludes "in kind" income such as SNAP, medicaid, rent or subsidized housing and perhaps EITC and it is unclear whether cash benefits from government sources are included. The exclusion of such as these skews the real financial situation of the lower two quintiles towards apparent poverty. A fine point. I was recently reading recently pointed out that, thanks to new metrics from the Census Bureau, California actually leads the nation in poverty, both in absolute numbers of poor, and in overall percentage. (Hitherto, poverty was decided based on the Federal definition, which makes almost no sense; by adjusting for cost of living at the county level, the Census number give us a much better view of who is poor and who is not.) A similar approach might yield some interesting results with respect to minimum wage workers. One problem I see more broadly with discussions of minimum wage employment is that it is roughly split into two roughly equal groups: one 16-25, and all other older workers (http://www.bls.gov/cps/minwage2013.pdf). This suggests there is a small cohort that continues to get minimum wage work long after younger workers have gone on to more remunerative employment. If you are going to have a minimum wage, it might be very well to eliminate it for the youngest workers, so as to give them work opportunities -- a first rung on the ladder of their careers. Yes...good point about there being two groups. Not sure the minimum wage can be legally targeted. Even if so, the effect might be more of an issue for the older workers who may depend on that income, but, at the margin, face job losses as the minimum increases. Want to add that the Supplemental Poverty Measure (SPM) in the article seems more comprehensive in measuring additional significant factors that can determine a family's overall financial position and if it is enough to meet basic food, clothing, shelter, and utilities needs (they even include a factor for medical expenses). I will be looking for that from now on. Thanks!